A news report in the West Sussex County Times reflected the increasing frustration locals in the Billingshurst district feel about their views being overruled by Horsham District Council's Development Control South committee. In the absence of an adopted planning framework, council officers recommended that councillors approve another in a series of major developments in Billingshurst on the grounds that it would be passed at Appeal by the Planning Inspectorate should they refuse it. The majority voted to approve the development at Marringdean Road. This year we return to Plumpton College, the expanding and thriving home of East Sussex land-based education. Established in 1926, the College’s 800-hectare estate is one of the largest and most diverse in the UK. Set in an Area of Outstanding Natural Beauty at the foot of the South Downs, it offers the ideal setting for our 2014 AGM. The Brighton & Hove group initiated contacts that have led to CPRE Sussex becoming actively engaged with the Deans Protection Group in Ovingdean and Rottingdean, who are campaigning under the banner of “Save Our Deans.” Save Our Deans is fighting proposals by Lightwoods Property for the construction of 112 houses on Meadow Vale field, a greenfield site at the junction of the villages of Woodingdean, Ovingdean and Rottingdean, bordering the South Downs National Park. Our Summer visit will be to Charleston Farm on June 14th. We will be inviting members from Wealden and Brighton & Hove. Below are six key commitments that we believe are essential to protect and enhance valued countryside. We want politicians to take them on board. Forward-thinking development that ensures the environment is resilient and able to absorb the demands we place on it – ‘Smart-growth’ – is the way forward to make meaningful progress. To do this we need to unlock brownfield land and link sustainable transport with the regeneration of towns and villages as healthy, distinctive, vibrant places to live and work. We want to see places created that will be a joy to live in and visit now and in the future. We believe in a holistic vision for town and country, liberating brownfield sites for regeneration, promoting high quality design, excellent environmental standards and distinctive places. Genuinely affordable housing is a priority; backed by communities, provided by Community Land Trusts, local co-operatives and housing associations. Sprawling ‘clone’ market developments with a handful of mean spirited affordable homes are a serious failure to invest in our future. Truly affordable housing integrated and in character with existing settlements is the way forward. We believe that in rural areas genuinely affordable housing developed by local providers, in tune with the character of villages and towns, should be the priority over sprawling market housing developments in the countryside. As citizens we all have a responsibility to use our voices and votes actively to protect our countryside now and in the future. The countryside is there for everyone – whether for its environmental, social or economic value. Local people know and love their local areas and care about the long term future of these places, well beyond the short-termism characterised by the current national market driven approach. Visitors often become attached to special places so can add their voices to protect such areas. Local people must have a strong voice to ensure future- proofed decisions: innovatively designed development with excellent environmental standards, in the right place, to meet people’s needs. The countryside needs protecting and cherishing to be fruitful – both for our own sake and for the wildlife and rich ecosystems it can support. We must embrace a ‘new sense of Stewardship’, helping farmers and landowners to work smarter so that they can deliver our food and development needs while respecting the land that is vital for our health and wellbeing. Funding schemes that support farmers to nurture biodiversity and protect the environment must be strengthened, enhanced and monitored to make sure they produce the results we all want. 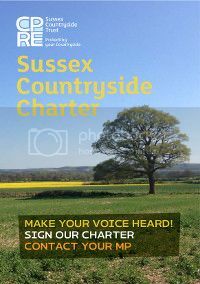 Getting around is vital, but it is in all our interests to protect the character and tranquillity of cherished Sussex countryside. Proposals for a second runway at Gatwick represent a major threat without clear benefits for local regeneration. Air and noise pollution, HGV and car traffic will hugely increase coupled with unprecedented concreting over of the countryside for new housing and business development. We believe there is enough runway capacity already, there is no need for a new runway anywhere. A responsible approach is to invest in rail travel as a more sustainable option for viable journeys within UK and Europe. Roads are a vital artery in Sussex life, but in recent times plans for major new roads have posed grave threats to areas of wonderful countryside which once under tarmac are gone forever. We cannot provide for unlimited traffic demands without severely damaging the countryside. Air and noise pollution diminish quality of life and emissions contribute to a more chaotic climate. We want to see better local rail links, along the coast and linking towns - and to London from coastal towns in need of regeneration. Faster and direct links are vital. Positive investment in sustainable transport is the responsible way to better connect Sussex, avoiding unnecessarily damaging airport and road expansion. Energy developments are increasingly controversial and challenging. There is no silver bullet to meeting our long-term energy needs. A mix of sources is inevitable. Energy efficiency must be prioritised in all new and existing buildings to reduce use and dependency. Renewable energy is a priority to avoid the worst effects of climate change. The right place for renewable energy is roof space for solar panels and wind farms where they are sensitively planned to protect our most precious landscapes. Fracking, a fossil fuel supply, and the current rush for gas risks irreversible damage unless there are cast iron guarantees that it can be made safe. It risks harming the character and tranquillity of our villages, and without a strong community voice local impacts could be overlooked. As a result, the health and wellbeing of our rural communities is hanging in the balance. Nationally designated landscapes are our most precious asset and it must be clear that fracking has no place in these areas. For a positive future, energy developments must be well planned and policed to avoid irreversibly damaged industrialised landscapes. The health and wellbeing of people, wildlife, natural eco-systems and agricultural land for future food security must surely come first. Charleston Farm is on the right of the A27c oming from Lewes signed to Charleston Farmhouse just past Middle Farm. On the approach the road is marked in red. It is a family run farm at the foot of the Downs which keeps a herd of 160 autumn calving Holstein/Freisian milking cows (milking will be in progress). On their adjoining farm in Beddingham the family have a beef herd and sheep. The farms are in the Entry Level Conservation Scheme and pay careful attention to the preservation of hedges, and field boundaries etc. In last week’s edition you publish a report that a new 10,000 house town near Henfield and Wineham that is being promoted by developers, Mayfield Market Towns Ltd, would destroy the habitat of an important barn owl population. The would-be developers claim that the real issue is whether their new town there would provide a better solution to delivering much needed new housing for local people. This claim perpetuates two myths - firstly, that there is an accepted local need for a new town on the southern borders of Horsham and Mid Sussex, and secondly that its proposed location is suitable and sustainable. Neither is true. Both Horsham and Mid Sussex District Councils are in advanced stages of developing long term plans for their Districts: neither of their plans calls for any new market town to meet their Districts’ housing needs. As to location, it is difficult to envisage somewhere less suited to a mega-development than the lovely open countryside around Wineham with no significant local unemployment, with no road, rail or other infrastructure, and on low lying fields prone to flooding from the Adur. Not to mention the barn owls, nightingales and other wonderful wildlife. We challenge Mayfield to publish the ecological and flood reports that it claims to have commissioned so that we can all judge for ourselves.